Previous version Vault-Hide SMS, Pics & Videos 6.5.11.22 apk for Android will help you to downgrade or install older app easily. This is one of the best Business apps. You never need to worry that you will lose your videos, photos and messages. You can also prevent all bad things when you install this app on your phone. 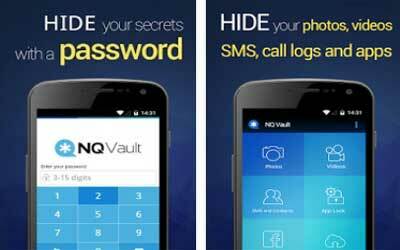 This Vault-Hide SMS, Pics & Videos for Android will help you to prevent some problems too. You can insert some private elements inside of your smartphone. You can protect your smartphone by making password too. In order to increase privacy on your phone, you need to create complicated password. You can also insert different safe ranges from some videos and photos on your android devices. This tool is suitable for all of you who really want to protect all files on your smartphone. Most people love to use this app and they feel happy because this app is effective app to make all files in safe place. This app is available for free and you can download anytime you want. This app is made by NQ mobile security and for all of you who want to download this app you need to prepare at least 2.79 MB for this app. This app is available in English language only. It is time for you to download Vault-Hide SMS, Pics & Videos for Android. It is very fine app. This app never allow to open any items you hide without password. I love it.